The Aire Castle Inn B&B offers stained glass workshops, or you can commission a special piece by artist and innkeeper Mike Driver. Create custom cabinet doors, built-in or free-hung windows or stained glass window sun-catchers. 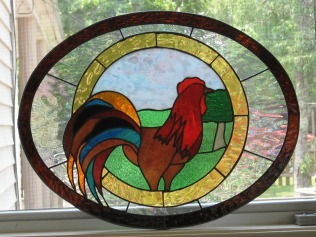 Commemorate a wedding or anniversary by building a stained glass project together. Reserve your stay at the B&B and plan your project ahead of time, so you can start to work on your work of art as soon as you arrive at this peaceful haven. “Celtic images such as the three-pointed Trinity Knot and the romantic Irish Claddagh wedding band are favorite projects,” says Mike. 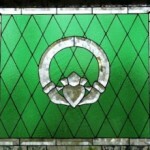 Traditional styles with clear or subdued colors of glass will fit in any home. Bright colored windows are usually designed for a specific home or decor. 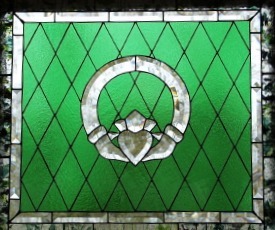 Some projects take weeks of effort, so returning to the romantic B&B is an added benefit to your own stained glass art. 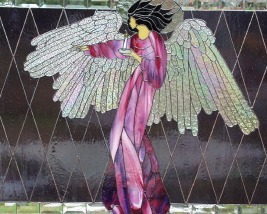 The Angel is in the Prayer Chapel at Heartland Worship Center in Paducah, insured for $2,000.00.